Our not as often as you might imagine at-home school is actually on-the-road school, while vacationing school, in the woods school, with groups school, at grandparents' house school, at the library school, at the hospital school, while shopping school, in our family business school, on the farm school, well, that last part at least is at home. Homeschool can be different for every family. Ours changes depending on our plans each day. In theory, I still dream of the calendar filled with white space and our time spent more often at home, but for us, that isn't reality. It hasn't been our reality for most of the years that we've homeschooled. So please don't get a mental picture of how homeschool has to look. Unusual just might be the norm. Welcome to the Virtual Curriculum Fair. As in years past, I've joined other homeschool bloggers in sharing how we homeschool. You can read over 20 different ways to approach each subject. This week our introductory topic is See How We Learn. 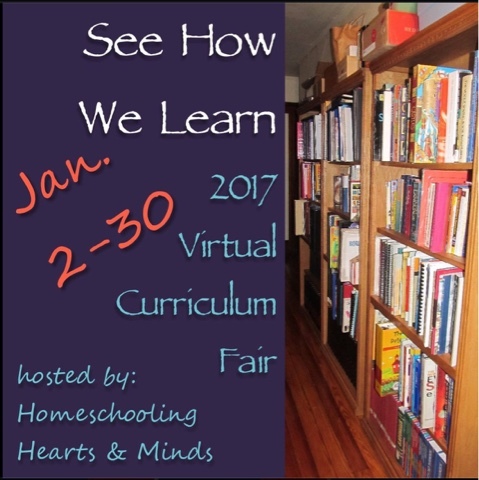 Our VCG Fair host is Susan who blogs at Homeschooling Hearts and Minds. Visit her and the other bloggers linked in our blog roll below. You can even link with us and share a blog post about your own style of homeschooling. How we learn... Our homeschool has changed from "doing school at home" complete with individual desks and a formal schedule to a much more relaxed lifestyle of learning. In the next few weeks of the Virtual Curriculum Fair I'll share more about our specific curriculum. Although in the past I combined lessons for more than one child at a time, this year the two remaining students (my oldest daughter graduated last spring) don't share any classes except for those they both do with our homeschool group. Since I mentioned our group, this is a good time to tell you, if you aren't already plugged into a homeschool group, find one. Support from others who have chosen this same not-quite-mainstream way of education is essential. Our current group involvement is primarily book club and field trips. We also encourage the kids to participate in church and community groups. Our library offers resources and classes including a lovely volunteer who teaches knitting. One of our goals is for our children to love learning. Granted, math lessons are not eagerly anticipated, but showing the usefulness of the concepts even make an unenjoyable subject more palatable. Not everything can be fun, but learning can be delight directed. As curriculum reviewers, we've tried unit studies, online programs, traditional and not so traditional books, and options that have shown me it's not so much the method of delivery but the content and how a child connects and grasps what is being taught that makes a memorable lesson. We live on our multigenerational family farm in Louisiana. Over the past year, falls of older family members and the felling of trees in our forest both influenced our family life and our school plans. My in-laws extended their time with us in their camper on our farm from one month in the spring to staying through October. We changed plans again and they often included my son in their morning Bible study. Our state was impacted by flooding twice in 2016. Homeschooling gave us the flexibility to switch lessons around, take some lessons with us, and serve friends and family members impacted by the muddy water. We are in the middle of seventh grade for my son and eleventh for my daughter. Currently on break, we plan to officially resume lessons next week. The Virtual Curriculum Fair lasts for five weeks. Be sure you don't miss next week's fair to read each of our different approaches to teaching language arts. My kids are still toddlers, but I can't wait for the day we're able to embrace a lifestyle of learning at home :) We do little things now (reading loud, playing), and it's so fun to think about and plan an education experience so different from the norm. It took me a while to realize it was acceptable to be completely different. Starting out that way you'll be ahead of me in the beginning. Enjoy them at every stage! We looooove our homeschool group! I can't imagine homeschool life without them! I totally agree about the importance of finding a homeschool group to help you along! Ours have provided some of the best learning experiences and friendships we could ask for. Kym, I concur. Homeschool groups provide friendships and learning experiences for both the children and the adults. For new homeschool families, they can also provide insight. My 1st attempt at homeschooling didn't go well at all. My 2nd was much better and it truly helped to have the support and encouragement of other homeschooling families. They have been a huge blessing! Jennifer - I like how you shared that your homeschool has become more relaxed in routine. My 1st attempt to homeschool was when my son was in 2nd grade. We used a curriculum that was very rigid and difficult. I had chosen it because it was the curriculum he had used in Christian school the year prior. I honestly had no idea so many options existed. At that time, my child didn't have his diagnoses of Aspergers (high functioning Autism), ADHD, and Learning Disabilities. Fast forward to 8th grade, a better informed mom who knows so much more about homeschooling, what resources are available, how my child learns, and that learning doesn't have to be rigid and we have a successful 2nd attempt at homeschooling. I think we learn and grow as we work with our children. Kym, friendships are one of the best things about homeschool groups! Kelly, options have expanded so much since my graduate first started. We tried that rigid approach, too, and it was not fun. I'm glad your second time around has been successful! I love reading how others school! We, too, love our homeschool group. The kids take classes one day a week and love it! We don't currently have classes, but we have enjoyed that in the past. Kirsten, when I first started homeschooling, moms who were willing to share their ideas were a treasure. Now many of those same moms have become dear friends. We did have a season when my husband was home with the kids more than I was while I worked, so he does understand a lot, but even then I was the kids' primary teacher for schoolwork. I'm glad we were able to make it work with me being home with them for a few years. I am so glad to see you love your homeschool group. We have been active in our local group for many years. Sadly people don't see a need to be involved with it any more and our membership is declining. We've had many families with kids who graduated move on, but homeschooling is much more accepted than it used to be. Our group has grown steadily with new families with younger children. I agree, having a local group is great for finding support and opportunities for the kids. Our local homeschool group has been great for organizing book clubs, field trips, service opportunities and even homeschool ballet. I completely agree--homeschool groups are invaluable! It also helps you get to know the community better when you move, because they know the best parks and field trips and all that fun stuff! "Unusual might be the norm" YES! That should be on a plaque or something.